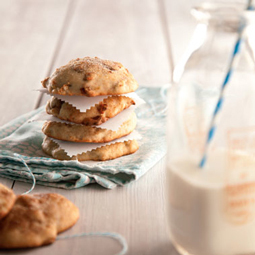 Bacon Banana Cookies - A recipe from Savor California, the online showcase for extraordinary gourmet foods and beverages from California. In a large mixing bowl, sift together the flour, baking powder, baking soda, 1/2 teaspoon of the cinnamon, and the salt. In a medium mixing bowl, use a hand mixer to cream together the butter and 1 cup of the sugar. Beat in the eggs, one at a time, until they are fully incorporated. Beat in the vanilla. Add the butter mixture to the flour mixture, then stir in the mashed bananas, beating well after each addition. Fold in the bacon. Stir together the remaining 1/4 cup sugar and the remaining cinnamon. Drop the dough by heaping tablespoons onto the prepared baking sheet 1 inch apart. Sprinkle generously with the cinnamon-sugar and bake for 10 to 12 minutes, until slightly browned. Allow the cookies to cool completely before storing in an airtight container. Cookies will keep for 5 to 7 days.